In ceremonies today led by Secretary of State John Kerry, the flag was raised at the U.S. Embassy in Havana for the first time since 1961, signifying a re-establishment of diplomatic relations between the United States and Cuba. Although this renewal has its critics, people across five Latin American nations surveyed in spring of this year approve of the neighboring countries restoring relations, and the American public also overwhelmingly supports this approach. Nearly three-quarters of Americans (73%) say they approve of the U.S. renewing ties with Cuba. A similar median of 77% across five Latin American countries surveyed (Argentina, Brazil, Chile, Mexico and Venezuela) approve of this action. This includes 79% of Chileans, 78% of Argentines and 77% of Venezuelans. Brazilians (67% approve) and Mexicans (54%) are actually more skeptical of the deal than Americans, whose support has grown 10 percentage points since earlier this year. Both Americans and Latin Americans also support the U.S. ending its trade embargo against Cuba. 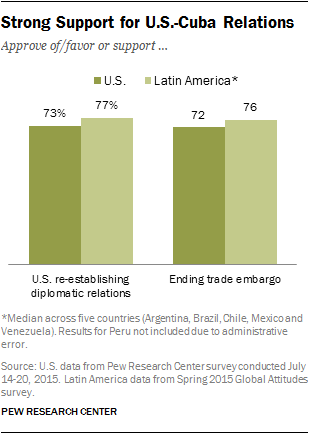 Roughly three-quarters in the U.S. (72%) and in Latin America (median of 76%) favor ending the embargo. Only in Mexico (55% support) is there less support for such an action. Furthermore, a similar share of people in Latin America and the U.S. think that over the next several years, Cuba will embrace democracy. However, far fewer Americans and Latin Americans hold this view compared with those favoring renewed ties. And Americans are far more likely to believe there will not be any great change as far as democracy in Cuba is concerned. A plurality in each of six Latin American countries surveyed (those listed earlier, plus Peru) say that Cuba will become more democratic over the next several years. A median of 47% say Cuba will embrace democracy, 27% say it will remain the same as now, and only one-in-ten say Cuba will become less democratic. In the U.S., 43% say that Cuba is bound for more democracy, although nearly half (49%) say that democracy in Cuba will remain about the same. 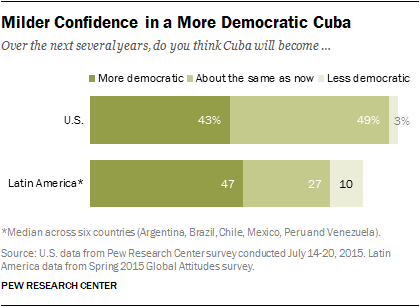 Only 3% of Americans say Cuba will become less democratic. Re-establishing ties is embraced across demographic groups in the U.S., though Republicans (56% approve of renewed ties) are less supportive of the action than Democrats (83%) and independents (75%). In Latin America, there is also general consensus across demographic groups. But higher-income people in the Latin American countries surveyed are generally more supportive of ending the trade embargo than are those with lower incomes.